Did you have fun during CES 2019? We sure did! Here are some of the things SparkAmplify did to connect brands and media before and during CES. CES is a huge, excitingly chaotic and vivid event that could get anyone lost, literally. This year, in Eureka Park alone, 1200+ startups from 50+ countries come together to showcase some of the best innovations. For brands, we know it's not easy getting media attention - especially with CES being in the largest tech event on earth, and it isn't easier for media finding the right companies to write about either. SparkAmplify is here to bridge the communication gap. With our on-demand press conference and AI-powered intelligent media outreach platform, hours of research time are saved for both brands looking to pitch to relevant media influencers and for media who are always in search of sources for their next big story. SparkAmplify is a data-driven SaaS platform that facilitates the communication between brands and media, removing all the traditional barriers, and creating lasting effective relationships. From helping startups in different events such as TechCrunch Disrupt San Francisco, Echelon Singapore, RISE Hong Kong, CES and MWC, we started thinking: Is there a better way to connect brands from all over the world with media, before the event? What if there is a conference where people from all over the world could join and access relevant press information of every exhibitors anytime, anywhere? And thus the on-demand press conference page. The on-demand press conference has the crucial elements of a traditional event press conference - a place where stories are told and picked up. We pull out information from each exhibitor's SparkAmplify profile and present them in different sections on our on-demand press conference page. Brand Stories - I think we can all agree that passion and enthusiasm go a long way. An interesting piece must include the "whys" - that's the heart of the whole story. In brand stories section we present each brand's "founder's corner" videos or product videos. A founder's corner video should include a company's core value, visions, how and why the company was founded, and the journey behind a specific product or service. It's like a pitch stage, but better - your pitch remains accessible on the page throughout CES. Curated Startup Stories - For your inspiration, SparkAmplify's editorial team hand-picked some of the best innovations from CES this year according to our industry-first SP Index (will be elaborated on later) and put together some curated content. These articles can be shared or modified for repost. Featured Exhibitors - Press information of exhibitors in a glance. Every brand can create and manage their own SparkAmplify profile. A SparkAmplify profile is essentially a visual press kit that holds all the information media wants. Logo, description, product feature videos and pictures to showcase a product; social media links to further engage with media and audience; timeline to map our a company's brief history, and the best part, automatically updated press coverage, weekly. Top Categories by SP Index - Trending companies at CES, according to our SP Index, categorized. SparkAmplify’s Social Proof Index provide brands a score based on their media outreach efforts and placement results. SP Index is an industry-first index that takes into a brand’s social proof based on social share, placement number, placement announced time, placements quality, impression and search ranking. SP Index is scaled from 0 to 100. Every brand on SparkAmplify has its own index and often updated to reflect current results and trending. Example: A brand with SP Index of 90 means it has better media exposure results compared to with another brand with a score of 50. Top placements by company - To prove that these companies with highest SP Index are trending among media, we collected top placements of companies with the highest SP Index in different categories. Read what others are saying about the trending companies. CES Media Mentions - Articles from media influencers that are taking over the internet. Click on different articles to learn more about the journalists and read all of their past articles in one place. For SparkAmplify users, you can also log into our platform and connect with these media. As an exhibitor, you have a space to show off your innovations to media who are interested in CES. Share your core values with a founder's corner interview, demonstrate your product features in a video, and most importantly your SparkAmplify profile holds all necessary press information in one place. You can also hunt down your potential strategic partners in a more efficient way. As a media influencer, you can find some of the best exhibitors that are participating in CES. Find inspiration for your next story here, before the event starts. Access their media-friendly profiles to quickly understand the company. What you can find in a traditional press kit you can find it here. Access brand logos, descriptions, product features video and pictures and founder's interview. Review their key milestones and past coverages in a glance. Connect with core team members via LinkedIn, and send your inquiries to their press contacts. With SparkAmplify's Social Proof Index (SP Index), we are able to identify trending companies of each event. We analyze each company's overall online placement performance and list out top startups to pay attention to. Find out which categories are taking up the headlines, popular companies among media in each category, and their top placements. SparkAmpLab's editorial team hopes to inspire stories with stories. We've chosen a diverse range of our best CES exhibitors and curated startup stories that can be shared or modified for re-post. We encourage startups to do the same - create their own content for each event and distribute the content strategically as part of their PR strategy - be it story pitching, or engaging with followers on all types of social media. Some of the exhibitors we picked this time include Meersens, an innovative French startup creating a safer, cleaner environment for families and their loved ones with their Mbox and Msen capsules; Moffi, reforming how people make use of available workspaces in a way that benefits both the owner of property and people who are looking for available spaces; Maker Hart, a company with a strong passion of sharing the joy of creating music, makes the creation of music easier with their unique mixers and other products. There is also Lite-On, not a startup, but an experienced company revolutionizing smart cities with AI-powered smart street light. You can also read about the eye-catching invention of ORII, a ring that uses bone conduct technology that could become your personal assistant in the future. Dutch startup Roader, on the other hand, enables you to capture every important moment in your life with their innovative and wearable Time Machine Camera that easily captures footage of 10seconds ago. Looking for smart home gadgets? AIFA's i-Ctrl is the hidden gem. i-Ctrl frees your entire home from remote controls with one device and an app on your phone. Another interesting company improving your life at home is Flo Technologies. With it's product, home owners can detect and prevent water leaks at an early stage. These exciting new ideas are just the tip of an iceberg. In the future, we have bigger plans to organize creative, original content from all companies and initiate meaningful connections between brands and media. 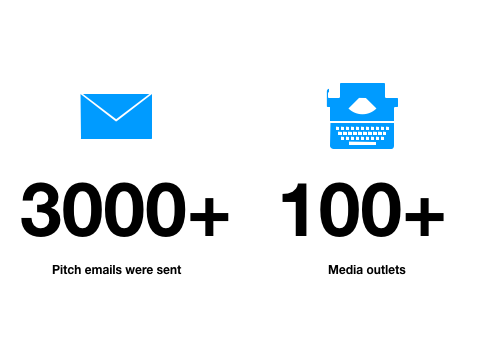 During CES 2019, 3000+ pitch emails were sent to media influencers from 100+ media outlets with the help of SparkAmplify. Our AI model filters out the noise so brands and media can focus on what matters - telling the story the way they know how. As an AI-powered intelligent media outreach platform, SparkAmplify facilitates the communication between brands and media. Our AI model recommends relevant media influencers to brands and vice versa. Brands can discover recommended media influencers based on their categories, keywords, and each media influencer's past articles and beats; media influencers, at the same time, are recommended with brands that are of their interests. As a SparkAmplify user, 80k+ media influencer data is accessible. We even customize lists for specific events, like CES. In the "event list" section, find writers who covered a specific event in the past, and are likely to cover the event again as well. Find media influencers who covered a competitor, or an industry in general. Send pitch emails directly on our platform or interact with them via social media. We've collected all the information needed to engage with media. AI-recommendations. Save hours of research time. Find the right people to pitch to in no time. Pitch email automation. Even people with little to no PR-related experience can write a good pitch email. During events, this is an extremely powerful tool for brands to earn press coverage with little cost. We take the heavy loading out of the media outreach process. You focus on telling your story, and we'll take care of the rest.